This is our traditional Muktinath Trek but without the huge climb up and over Gorepani. Last season we jeeped into Tatopani and then Kalopani next day. The group was varied in abilities and soon divided into the trekkers, the jeepers and the fifty-fifties. Great way to go so it is on again this year starting mid October for 18 days. Price at $3450 (AUD) is for absolutely everything everywhere. Airport transfers, hotel and all meals in Kathmandu and on trek, all permits and TIMS, INDIVIDUAL porters properly insured, the best jeeps we can find, internal flight Jomsom-Pokhara and ME, of course. This has always been a great trek but now we can descend from Muktinath via the new trail over Jhong (previously in Upper Mustang special permit zone) it just got a whole lot more interesting. This is a holiday and includes quite a few days of 'not trekking' both in Kathmandu and Pokhara. Completely different cities each with its unique charm. Crowded, bustling, noisy, exciting Kathmandu and laid back, casual, easy-going Pokhara, much lower and therefore much warmer. Our hotel here overlooks the lake. While we jeep through the hot, dusty foothills to Kalopani there is plenty of trekking from that point on. Trekking between Anapurna and Daulaghiri is spectacular stuff, though we will follow the Kali Gandaki River on reasonably level riverbed trails. We trek through old Buddhist villages like Kobang, Tukche and Marpha to Jomsom, that wild northern frontier town. Above Jomsom we are in the Theragaon (13 Villages) region, first of which is Kagbeni, a medieval ruin. It is a stiff climb up to Muktinath but we will stop at Jarkot and go the final few hundred metres next day. The final push takes you to the famous 'fire and water in the rock' phenomena. It is small and rather interesting, now covered by an old monastery for nuns. There is a Hindu complex too and many young couples come here shortly after their marriage for a blessing of children. Arrive Kathmandu. We will meet your flight and bring you to the hotel. We often stay out in the suburbs away from the backpacker scene in Thamel. Walk over to nearby Bouda this evening. Stretch your legs after a long flight and see the Buddhist community throng to evening 'Kora'. This can be a busy day. I will check your gear and let you know if you need to buy/rent anything for the trek. Then into Thamel. Time to exchange your money for rupees. A little gear shopping a few souvenirs to line up for after trekking and a decent lunch while I sort our permits and paperwork. Evening: Pack your rucksack for an early start tomorrow. Dinner at home. Drive to Pokhara in our own minibus. We stop in a few delightful little places for tea and lunch. The scenery is well worth the long ride. Hotel Lakefront. Name says it all really. Warm evenings, outdoor dining. Our own dedicated jeeps will collect us at 7 am for a stunning ride. First on a winding sealed road with (hopefully) fantastic views of the Anapurnas as we ascend to Nyapul for a cuppa then press on to Beni (don't stop here, its awful) and the lovely Galeshwor for lunch. The road is hot and dusty and extremely poorly maintained but it is just for another hour to Tatopani where Nilgiri South dominates the view. Warm enough to eat outdoors. DAY 6: Oct 26: Jeep again today, and we should be in Kalopani for lunch if all goes well. Winding above the Kali Kandaki river we reach the pine forests at 2500 m. Great Lodge, the See You, and time for a great walk out to Titi Lake in the afternoon. Destination not that spectacular unless the weather is perfect but a great walk in itself. An option to trek up today if you like. From the roof of the lodge the view is divine, possibly better tomorrow morning. DAY 7: Oct 27: Trek to Tukche. Now we should all be trekking. The Kali Gandaki valley widens out spectacularly. With seasonal bridges we could stay on the Eastern bank till we cross over to Larjung. Tukche is quaint and has stunning views of Nilgiri and back to Daulaghiri. Still just 2650 metres. Trek to Jomsom with tea at the Tibetan Refugee Camp at Chairo and lunch in the architectural wonder of Marpha on the way. Jomsom is large enough to have an airport, several banks (with ATMs), and a few supply shops. Nice little hotel too, the Mustang Taj. It is very windy here almost every day after lunch. They write songs about it. A very easy flatl trek today. Just three hours if the trail is in good shape. There were a couple of messy detours last season. Into the Asia Lodge for lunch in the warm 'solar room' (lots of glass). Same altitude as Jomsom. If we want to, we could walk to Thiri, just inside the previously-forbidden kingdom of Upper Mustang. An hour on from Kagbeni we are ok to enter if we return before 5 pm. Kagbeni is a crumbling medieval ruin though lots of new construction is gradually spoiling the vibe a bit. DAY 10: Oct 30: Trek up to Jarkot. 3400 metres. Jeep ride or pony alternatives usually available. Another crumbling medieval ruin, this time in its natural state of inevitable decay. Simple lodge and good cooking. Its a bit of a slog if you do trek up but still just a half-day walk. DAY 11: Oct 31: Trek to Muktinath then down to Jhong. It takes around an hour to reach the outskirts of Muktinath, then, after a cuppa, another half an hour to trek up to the temples. Buddhist flame and water in the rock and then the 108 snow-melt fountain taps (and plunge pool!!) of the Hindu temple. We will visit before lunch, eat, then move on, descending via the picturesque northern side of the valley. Midway back to Kagbeni is Jhong. Tiny traditional, ancient monastery, friendly locals. Great views morning and evening. A highlight. No fire in the dining room. Down jackets! Trek Jhong to Kagbeni. Nice and easy, downhill, gently, all day. Enjoy! Trek Kagbeni to Jomsom, over Windy Pass ?? 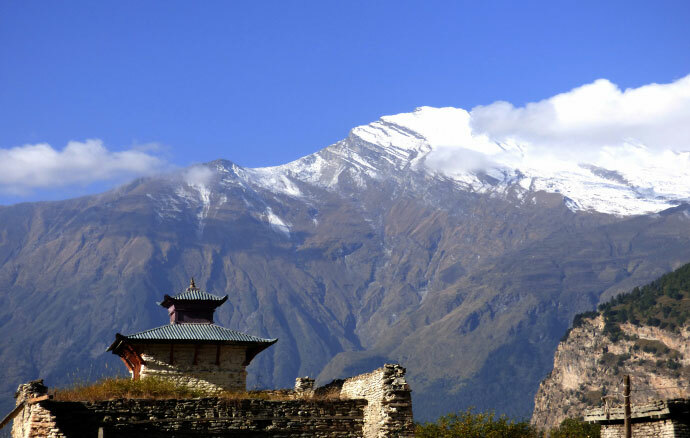 The return trek to Jomsom is easy, so a tougher option has been devised. Leaving the main trail just south of Eklai Bhatti you trek through unspoiled villages to a high, dry windy pass. It is a fairly demanding downhill scree slope back into Jomsom. Last year's group loved it. Up early today, either for a twenty five minute flight down to Pokhara or an early start for the jeep drive back. It did take all day last season but in our own jeeps with room to move and permission to stop when we wanted to it was almost pleasant at times and never dull. Rest day in Pokhara. Lovely hotel, lots of shops, bars, restaurants, cafes, massage, paragliding ?? Up early for the sunrise at Sarankot before breakfast (if you want to). Afternoon, an optional trip to the Tibetan Refugee Camp. Lovely monastery, tea with some friends (our guide's sister). Travel back to Kathmandu. Might arrange for this to be a flight if we can not fly back down from Jomsom to Pokhara. If not we will make it a comfy ride with interesting stops. Rest, sightseeing, shopping in Kathmandu. We will stay in Thamel this time. Good access for the above activities. We will help you organise whatever it is you want to do. This itinerary is not written in stone. This is trekking. Stuff happens. The weather, your health, road and trail blockages. All sorts. Whatever happens we will make sure that you have a great time getting out amongst the big mountains and lovely people of Nepal. CHEERS, Teresa didi.